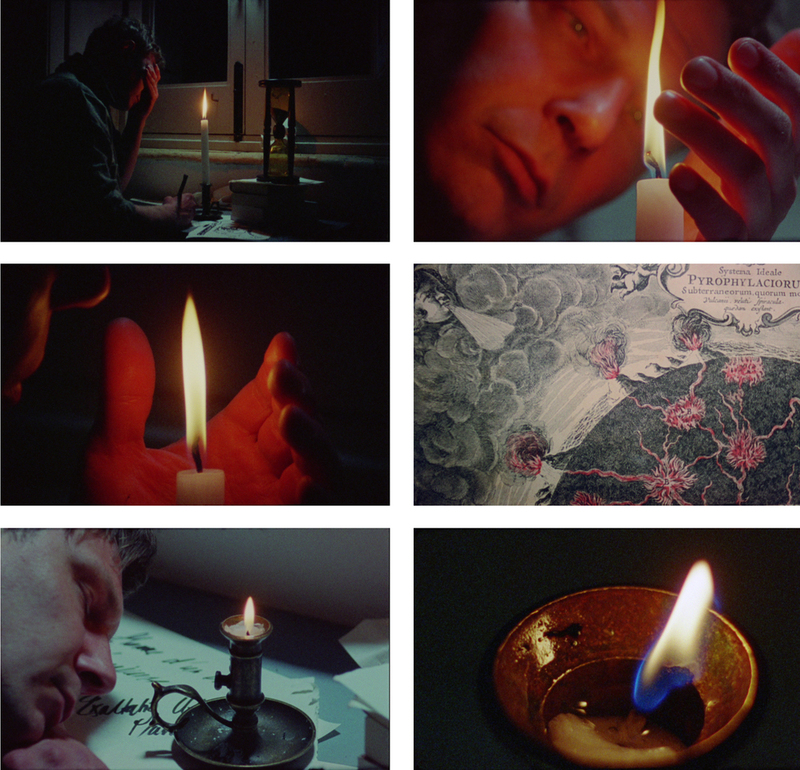 The piece explored poetical aspects of fire and flames and was based on the 1938 essay “Le Psychanalyse du Feu” (The Psychoanalysis of Fire) and the 1961 essay ”La Flamme d´une Chandelle” (The Flame of a Candle) by French philosopher Gaston Bachelard (1884–1962). It was produced for the Nordic Biennial of Contemporary Art “Momentum” in Moss, Norway, in 2014, and exhibited as an enclosed projection in a separate room in the exhibition space. The piece consists of a prologue that dwells on the dichotomical aspects of fire and heat in addition to three separate chapters, exploring fire and reverie and what Bachelard refers to as “The Empedocles Complex”, the verticality of the flame and the poetic images of the flame in plant life, and presenting a study of the flame of a single lit candle and the emotional relationship between the lonely flame and the lonely dreamer. Fragments of Bachelard´s essays, read by the English narrator John Berwick, accompanies imagery of flames, staged narratives involving an actor, various flowers, trees, and other images that communicate with an underlying contemplation of fire as one of the most complex of the four elements. As both a destructive and creative force and with a multitude of inherited symbolic meanings that are deep-seated in our unconsciousness. Parts of the scenes for the film were shot at various locations on the slopes of Silicy's Mount Etna, particularly the scenes for the first chapter. It deals with fire and reverie and the myth of the Greek philosopher Empedocles, who is said to have committed suicide by throwing himself into the erupting crater of the volcano. Bachelard extensively uses quotes from a wide range of poets in his essays to exemplify and construct his thesis on the various aspects of fire. An example that caught my attention and which I tried to visualize in my piece was his quotation from George Sand´s novel Histoire du Rêveur, 1830 (A Dreamer´s Story), describing a scene where a young man falls into a trance-like state whilst dreaming in front of a log fire. In the story, the young man watches how the moths are drawn towards the flames and thereby annihilate themselves. This image makes the dreamer compare the miniscule and the enormous, the life of a burning log and the magnificent power of the erupting volcano. The images of the flame in botanics and plant life are based on Bachelard's quotes from the German poet Novalis (1772–1801), who in one of his poems describes how “The Tree is a Flowering Flame”. This poetic image is a primary image for Bachelard in his analytical interpretations of how fire and flames are metaphors transcending the substance of matter. There are countless examples in poetry on how the luminescence and colours of specific flowers or plants “preserve” the light of the sun. The final chapter of my piece investigates what Bachelard refers to as “The Clair Obscure of the Psyche”: the pulsating flame of a single lit candle, struggling against darkness, and the dreamer, become one. Like a hypnagogic state, the gazing into the flame reveals the dreamer's own fragility, and imagination and reality merge into a fictional universe where the things surrounding us become enlarged and come alive. In this solitary state and in the dreamer's cell, the flame and the dreamer are united as one being.